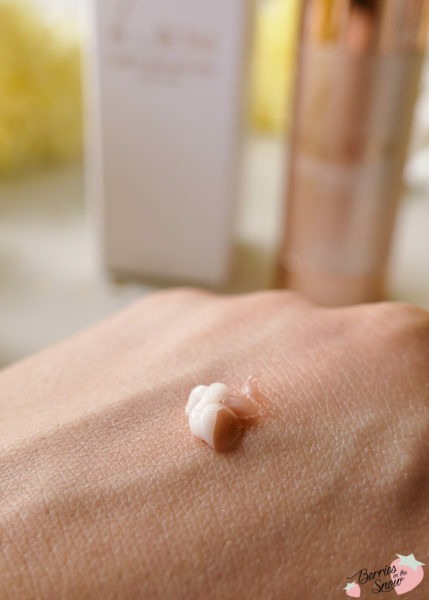 There are brands that you keep seeing all around, but somehow you never really get a chance to get your hands on them, or in my case, try to use up all your products lying at home before starting to open up anything new. A by Bom is one of these brands that I kept seeing all around and I was so curious how good or bad their products world perform for my skin. I was very happy to receive my first products from the brand by BemusedKorea some weeks ago. Luckily, one of the products was an eye cream and at the same time, my Erborian Bamboo Eye Gel was about to be finished. Perfect timing to exchange an old product with a new one! Here is my review for the A by Bom Ultra Time Return Eye Cream. 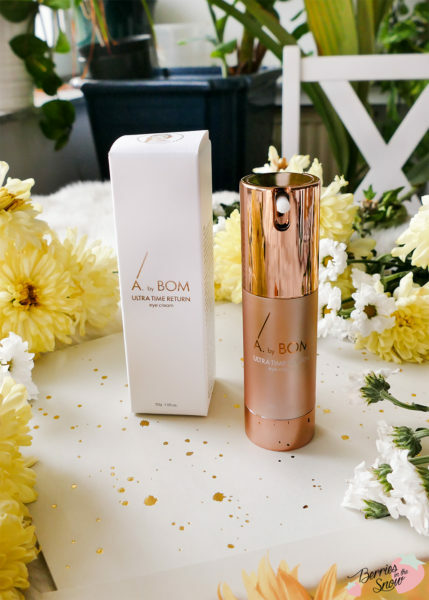 A by Bom Cosmetics is another Kbeauty brand from the vast amount of increasing KBeauty brands on the market. Their motivation is to take care of people and nature. 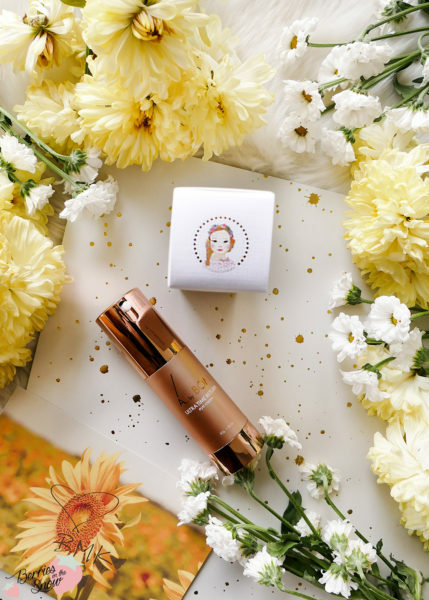 A.by BOM Cosmetics is made of natural ingredients of various vegetable oils and extracts such as rice, beans, camellia, jasmine, lotus, black teas, and so on. 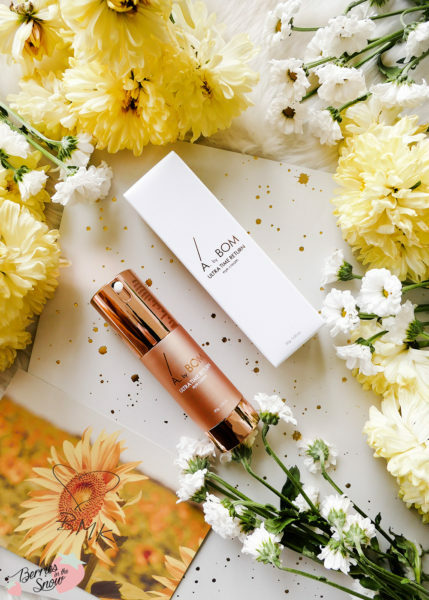 The A by Bom Ultra Time Return Eye Cream is a collagen-rich firming eye cream that comes in a rose gold pump bottle. A very elegant design, by the way, that looks good on every bathroom counter. The simple cardboard box of the product has the characteristic girl illustration on one side. The other sides are very simple and contain the Korean description of the product. Luckily, the ingredients were also listed on BemusedKorea, so I can also talk about them in the following. According to SkinCarisma, the A by Bom Ultra Time Return Eye Cream is free from paraben, sulfate, and EU allergens. It does contain silicone and alcohol though. The alcohol is the only ingredient which might be critical for dry skin types and sensitive skin types. Other than that you will find a bunch of plant-based extracts in the first place. Some noteworthy ingredients are Blackberry extract, Maca Peptide, Poria Cocos Extract, Ginseng Berry and fermented extracts. The blackberries contain natural collagen boosters. They protect and energize the skin. Maca Peptides strengthen the skin. Poria Cocos Extract gives strength and nutrition, while ginseng berries and fermented extracts hydrate and soften the skin. Additionally, niacinamide has brightening properties, and royal jelly adds more nutrients. 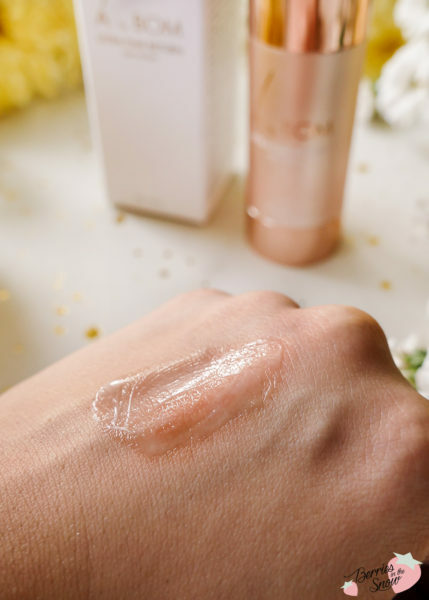 There are a lot of anti-aging ingredients, too: niacinamide, Adenosine, ceramides, and even Vitamin E.
If you look at the cream/balm-type texture you will already feel the protective layer that this eye cream creates. Thanks to Shea Butter and Mango Butter it feels very luxurious and rich. The balm texture feels satin-like and soft upon application and melts into the skin. You will fee a firming and cooling effect on your skin. The eye cream has a pleasant scent to me. Once absorbed it is not visible any longer and is not leaving oiliness at all. But it will feel a bit tacky and firm when touched. 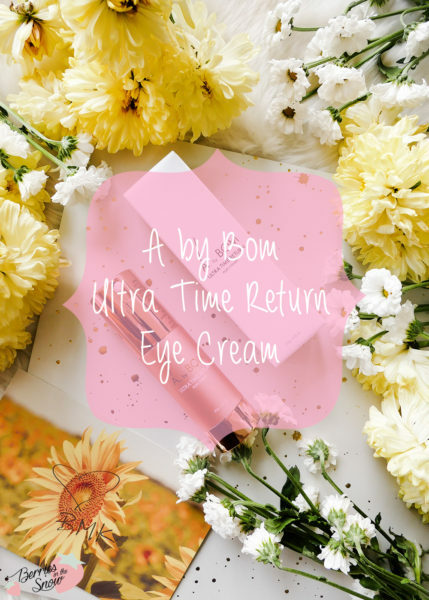 I personally love to use the A by Bom Ultra Time Return Eye Cream during the day. It creates a nice and rich protective film, especially in winter I love this kind of feeling. You can also use this cream on your lids and it doesn’t make the skin more greasy, for example. Of course, compared to my previous gel type eye cream from Erborian, it is not as cooling and moist, but it does have a refreshing feeling. I think that this eye cream makes a perfect replacement for my old one regarding the change of seasons here! At the moment, you can get your hands on the A by Bom Ultra Time Return Eye Cream for 39.20 US$ on BemusedKorea thanks to Black Friday Sales, which is 20% less than the regular price of 49US$! Have you tried this eye cream? What are your thoughts on eye cream in general? Useful, or do you just use the same cream for your face on your eyes as well? Just as a short reminder: All products mentioned and reviewed on this blog are of my personal opinions. This product here was sent to me for reviewing purpose by https://bemusedkorea.com/ which doesn’t influence me in providing my honest opinion on the products. Great article. It is very useful and informative about the eye cream. Thanks for sharing this post.